According to his mom, Sheepdog has always been infatuated with guns. That is no surprise to me. Now, Sheepdog’s dad is not really into hunting or guns and his mom is a Bill Clinton-kissing (she wishes!) liberal and very anti-gun, so neither of them was excited about the idea of their little boy heading out into the wilderness with one. But when Sheepdog was somewhere around ten years old he had bugged and badgered his dad to take him hunting so much and so often that his parents finally relented. Sheepdog’s mom held firm on one caveat… whatever Sheepdog shot, he had to eat. He agreed to her condition without hesitation. They borrowed a .410 shotgun, acquired the proper permit, and went off into the woods behind their house (hopefully not anywhere near the elementary school – which is also right behind their house – but I didn’t clarify and, frankly, don’t want to know) for Sheepdog’s maiden hunting experience. They were gone for about an hour. Sheepdog’s dad had figured that he would go into the woods to humor the kid, as he didn’t expect he could hit the side of a barn. His mom was even more skeptical. She had fallen asleep on the living room couch while they were out, only to be awoken by her beaming son standing over her, holding a giant (and very dead) chestnut squirrel by its fluffy tail. To hear Sheepdog tell it, that squirrel was as big as a rabbit. Also to hear him tell it, it tasted like chicken. Even then he was preparing to survive and take care of his family after The Apocalypse. That’s my man! Apparently it is customary for real hunters to keep a trophy from each of their kills (a la Daniel Boone and his cap). Many have the heads of their kills mounted on their walls. You may have seen or heard of people with animal tails hanging from their truck antennas or, for those hunters not yet old enough to drive, hanging off of their bicycle handlebars. Taxidermists make a living off of this stuff. Ew… vomit, but to each his own. Sheepdog was old enough at the time that his mom did not go into his room. Boys at that age are apparently best left behind closed doors (“I was combing my hair!”) until laundry or cleaning day. One of those arrived and his mom went into his room to try to wrangle the entropy. When she entered her senses were assaulted so fiercely that her eyes teared up and she started to retch. She searched blindly for the source of the stench and to her horror she saw that ten-year-old Sheepdog, now a proud hunter and marksman, had pinned his very own trophy on his dresser mirror… the dead squirrel’s rotting tail. I am beginning to rethink this whole “having boys” thing. Uh oh. 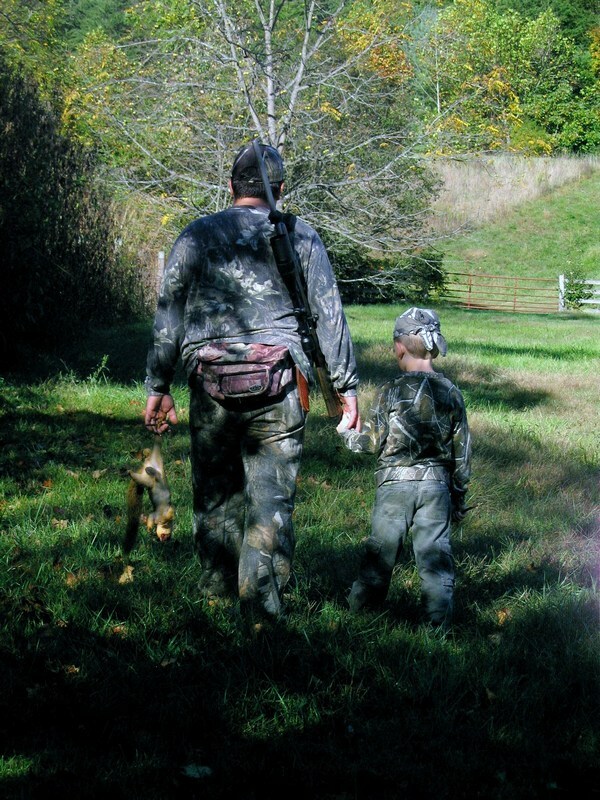 This entry was posted in family, kids, parenting and tagged Bill Clinton, camouflage, eat what you shoot, first hunting experience, gun control, squirrel hunting. Bookmark the permalink.